After significant tooth loss, finding a secure, well-fitting tooth replacement is just as important for your smile as it is for your overall health. Having a full set of teeth promotes a balanced, nutritious diet -- and it also keeps your jawbone healthy and whole to prevent further tooth loss. Patients who are eligible for dental implants can benefit from a dental implant-retained prosthesis, which is a denture or partial supported by prosthetic roots that are implanted beneath the gum line. It’s the very best option for a lifetime of happy, healthy smiles. Dentures have long been a common option for patients who have lost a number of teeth. Unfortunately, many patients struggle to find a proper fit with traditional dentures. Dental implant posts used to secure a denture eliminate this problem, securing the prosthetic with a stable foundation that just can’t be achieved when the denture rests on the gums alone. Dental implants can support a bridge (partial) or a complete denture. Both can be fixed or removable, depending on the patient’s specific needs and preference. Dental implants support the jawbone to prevent the gradual disintegration that occurs after tooth loss. An implant-retained prosthesis is completely stable, which supports a balanced, nutritious diet. It is easy to speak clearly with an implant-retained prosthetic -- no worry of a denture that causes a whistle or lisp. Dentures that are stable and secure will not slip around, eliminating the trouble of painful oral sores. 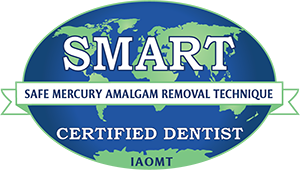 Ceramic, metal-free dental implants do not introduce harmful materials into the body or blood stream. If you are in suitable oral and overall health, you are likely a wonderful candidate for dental implants. As a holistic dentist, Dr. Thomas uses biocompatible, metal-free materials to protect your overall health and wellbeing, which opens the procedure up to even more candidates. During a consultation, Dr. Thomas will evaluate your health, discuss your smile goals, and examine your teeth to determine whether or not you are eligible for this option. If you are, she looks forward to getting started on your tooth replacement right away! To find out more about the specifics of dental implants, you are invited to contact the office of Dr. Preetha Thomas. Many adults are eligible for this tooth replacement option -- go ahead and request an appointment today!